The procedure itself is normally done as a single treatment that takes from 20 minutes to two hours depending on the treatment area. What’s more, there is no downtime, so you can quickly resume your normal routine. Unlike lasers, Thermage works on all skin types and tones. And unlike injections or fillers, Thermage works on your entire face: forehead, eyes, nasolabial folds, jaw line, jowls and the area under your chin. 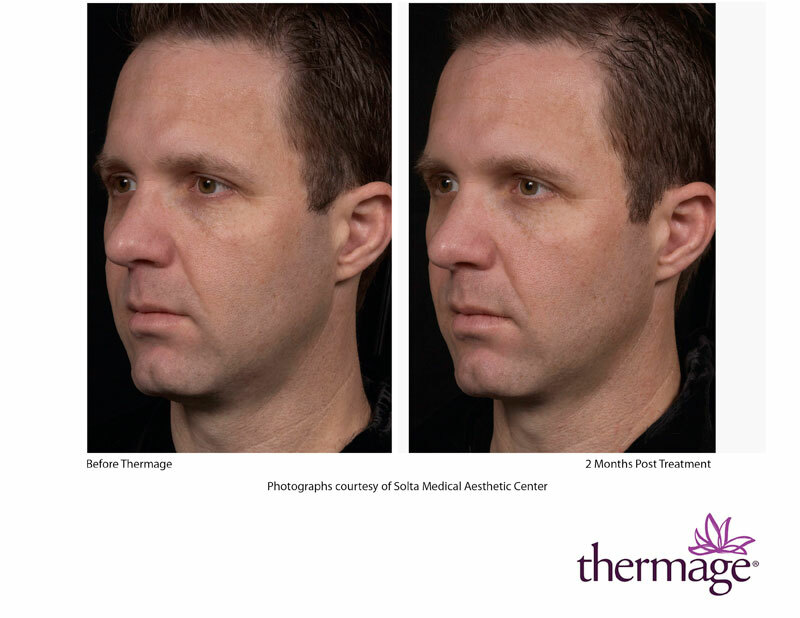 If you no longer recognize the face looking back at you in the mirror, it’s time to talk to a certified Thermage physician and learn how Thermage can help you look as young as you feel. 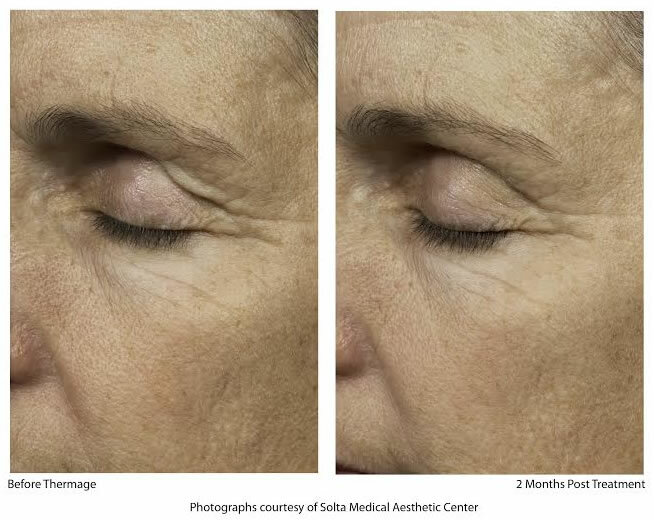 FDA cleared for the non-invasive treatment of wrinkles and rhytids. Side effects are generally mild and may include redness, swelling, blisters, bumps and rare instances of surface irregularities. * Your results may vary depending on age and skin condition. To understand how Thermage works, it helps to know a little about how your skin works. The facial skin is made up of three distinct layers: a visible outer layer on the surface called the epidermis, a collagen-rich under layer beneath the surface called the dermis, and an inner layer beneath the dermis called the subcutaneous layer, also known as the fat layer that has a web of collagen fibers running through it. When the collagen in these three layers breaks down due to sun exposure, family heredity, or the normal aging process, your face begins to sag and wrinkle. Naturally, treatments that work on just the surface can’t do anything to restore the collagen in the under layer or the inner layer of your skin. 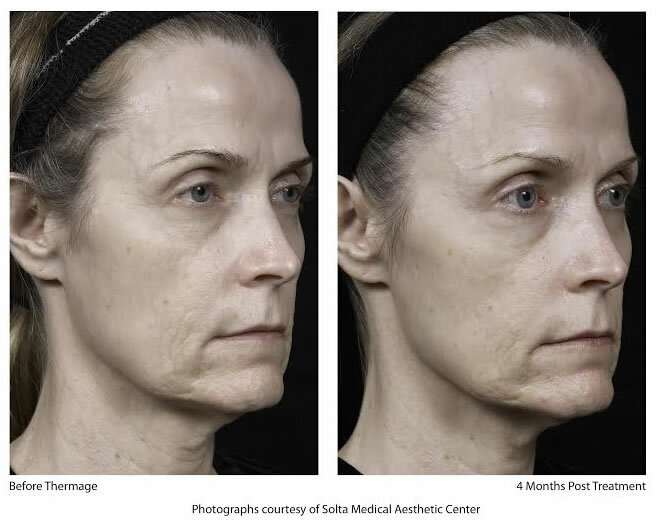 Thermage is the only non-invasive procedure available that tightens and renews your skin’s collagen in all three layers. How? 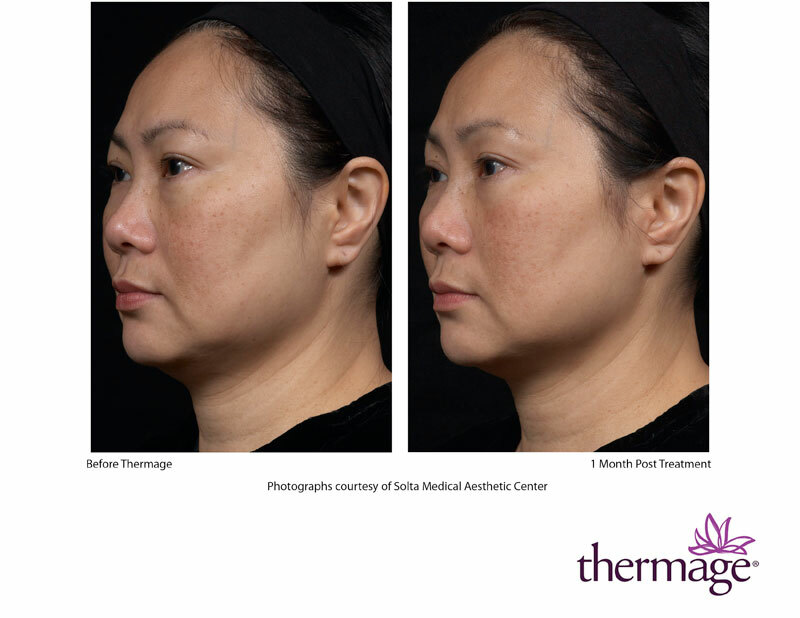 Thermage’s unique Capacitive Radiofrequency (CRF) technology safely heats your skin’s under layer and the web of collagen in the inner layer, causing an immediate tightening as well as improved tone and texture. And the improvements will continue and become even more noticeable for four to six months following treatment due to new collagen growth. Thermage works on all skin types and colors. Best of all, you only need one Thermage treatment to obtain the full benefits, not three to five as you would with some laser therapies. And there is no downtime, so you can quickly resume your daily routine. Women and Men 35-60 normally have the best and most predictable results. If your skin is too lax, the results will not be as dramatic. Normally, the complete procedure can be performed in just one session lasting from 20 minutes to two hours, depending on the treatment area. Anesthesia is not required. During the treatment, you’ll feel a brief, heat sensation each time Thermage delivers radiofrequency energy to the under layer of your skin. This indicates that your collagen is being stimulated and tightened. Immediate Results: You should feel and see your skin being smoother, firmer, and tighter immediately after your Thermage treatment. You may also notice some contouring effects which will begin enhancing the shape of your face. 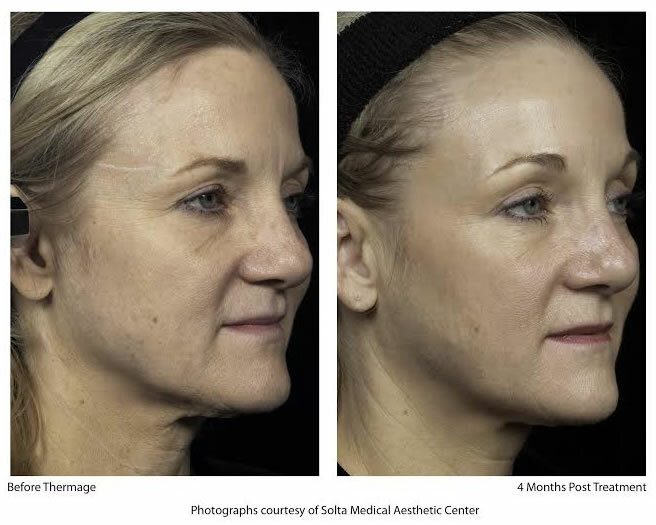 Continued improvement over time: After the procedure, you should continue to see improvements to your skin as a result of the production of new and increased collagen, as well as some additional contouring effects due to continued tightening over time. These effects will continue for up to six months. You should see lasting results. Thermage is a great complimenting treatment to other non-surgical procedures that we offer at Athena clinic, such as Botox, Dermal fillers and Chemical peels. 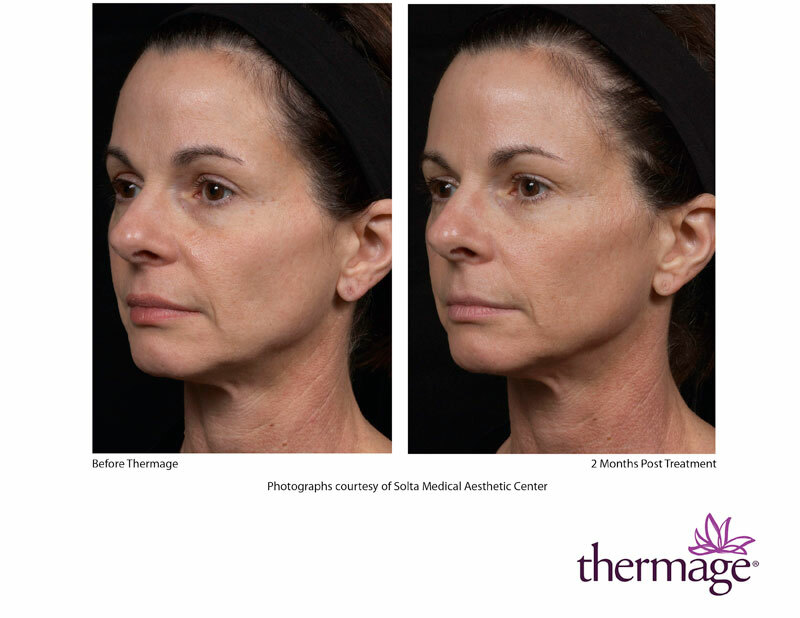 Thermage uses radio frequency technology to heat the deep, collagen rich layers of your skin. The heat helps tighten existing collagen and stimulate the formation of new collagen, which reduces sagging, renews contours, and improves the smoothness and texture of the skin’s surface. Unlike some other procedures, Thermage involves no surgery, no injections and little to no downtime, and Thermage works on all skin colors – on and off the face. While laser treatments and other radio frequency procedures also tighten skin, no other treatment heats as deeply as Thermage. By heating the innermost layers of skin, Thermage is the most effective at tightening collagen and stimulating the formation of new collagen, which results in tighter skin and an overall younger looking appearance. Each time the treatment device touches your skin, you’ll feel a brief cooling sensation, followed by a deep but brief heating sensation, followed by another cooling sensation. The heating sensation is a sign that the deep layers of your skin are reaching effective temperatures for tightening. Throughout the procedure, your physician will ask for feedback on the level of heat sensation to help balance your comfort with maximum results. It depends on the areas being treated. Fees will be discussed during your consultation. A full face treatment is typically $2900.